This man also claims there wasn't a distress signal. Once you answer the distress call, your ship seems to have crashed. When you enter the nearby town, a man in a white suit tells you that everything is fine, and that he has called in the Space Army. He then vanishes. Later, he acts like nothing is wrong. 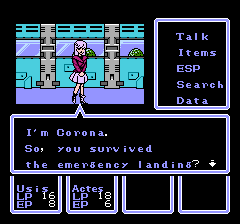 However, people around the town talk about a girl named Corona. Corona talks to the hero. I'm not sure if it is kickass or sexist that her starting weapon is a kitchen knife. 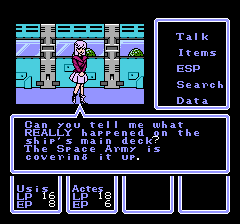 Corona says that there seems to be a coverup going on about the monsters attacking the ship, and she thinks that the space army won’t do anything. She offers her help, and the help of her robot Gap. Gap, unfortunately, does not come with the necessary chips to fight. Apparently, your team was on the ship that was attacked? It's not exactly clear. 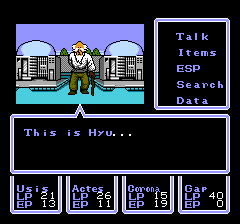 After about five levels, you’re strong enough to walk to Hyu. In Hyu, there’s talk of a bridge getting constantly destroyed. Someone else greets Corona and says her brother misses her. There’s also a seemingly drunk man inside one of the houses. Here’s a good example of how the translation seems more dramatic than it is. Many people in Hyu trail off the end of their sentences. This gives a feeling of anticipation that something is wrong in the town, but you don’t know what. Is this guy depressed? Or is it just a quirk of the writing? Gameplay wise, you can start to see early elements of the game. For example, Gap needs a mechanic to fill her HP. Damage to limbs needs a doctor’s exam. An Inn lets you crash for a number of nights, and also has a console to save your game. It’s also pretty grindy. 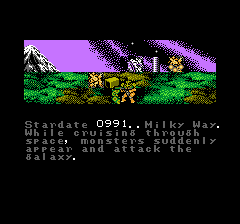 Phantasy Star was also grindy, but it’s not necessarily a good thing to emulate. You literally need to sleep about every two or three battles at first. 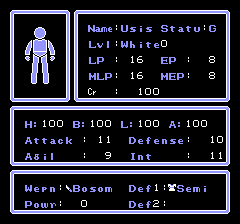 Stats are determined by the player, so you can feel some improvements as you level up, but it still seems to be a slow growth. Experience is set according to your level. This also keeps people from grinding forever in early areas. 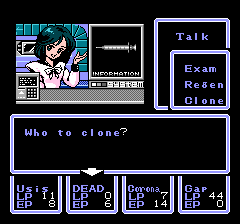 A dead party member is "cloned" to heal them. This is actually quite cheap. Equipment wise, it’s a bit fustrating. For example, Corona is knives and spears. Actes is guns and knives. Your hero is anything other than robot type equipment. You need batteries to recharge guns, which can get a bit tedious. For the most part, the best equipment to buy early on seems to be a spell for Corona (I got fire,) a gun for Actes, and a sword for the hero (named Usis in my game.) You could grind more to buy other items, but pushing your way to Hyu and getting a battle pack for Gap (so she can fight) seems to be a lot better. A page of stats in STED. The H 100 stat says that his head is at 100%. The little paperdoll also changes color as limb health is lost. I noticed the title of the article. Will you be playing through this and showing off the whole game? Since STED plays very slowly, at least for me, I’m probably going to be doing it very slowly. But yes, I plan on showing the entire game. I played up to the final dungeon before I stopped last time, and I know it’s a long endless slog to get to the ending. However, I think the game may be interesting enough to show off what there is to find in it. I agree. I tried to play it a while back, and it is SLOW. You, sir, have a will of iron to have made it to the final boss and I can’t wait to see more of this. Technically, it’s madame, but it’s close enough. There’s a lovely FAQ on RPGclassics with some really nice maps, which helped a lot. I actually didn’t get to the final boss. There’s some issue that was popping up with walking outside the map in the final dungeon. (As in, you’d no longer be on the map of the maze, and get stuck. There’s a computer room that has the same problem.) I did get up to the last ‘room’ of it, but I wasn’t strong enough to kill the final boss.